An Grianán Theatre is on the road South of the Gap as part of the Donegal Bay and Bluestacks Festival. 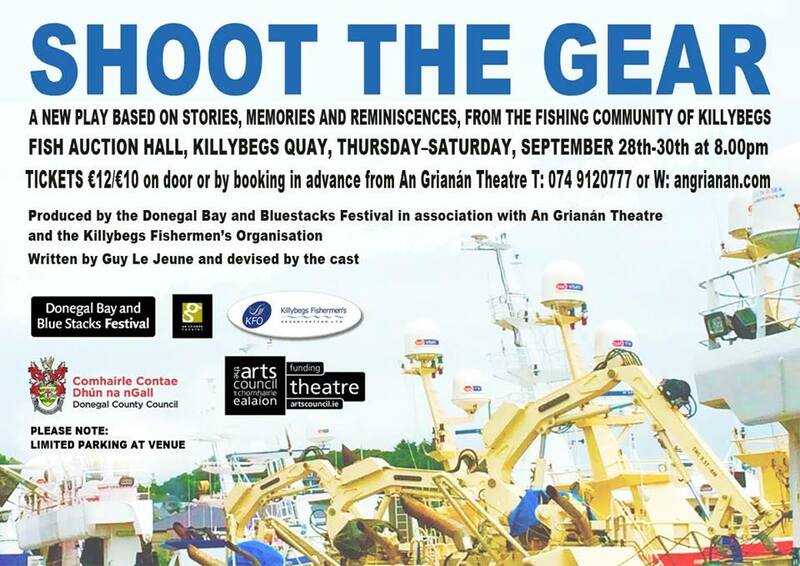 Our new production Shoot The Gear created by our Theatre Artist in Residence Guy LeJeune celebrates the stories and experiences of the Killybegs fishermen. The play which will be performed in the Fish Auction Hall on Killybegs Quay is a celebration of the fishing industry in words and music. Featuring a cast of four multi talented performers Ronan Carr, Louise Conaghan, Orlaith Gilcreest and Fionn Robinson, the show runs from Thursday 28 to Saturday 30 September at 8 PM nightly. The Shoot the Gear project has been facilitated by the Killybegs Fishermens Organization, whose support has proved crucial in gaining access to, and the trust of, a broad range of people connected to the industry, from fishermen and their wives and families, to buyers and sellers, net makers and menders, boatyard men, harbour staff, factory workers and more. Tickets can be purchased on the door or in advance at our box office on 0749120777 or online here. Tour: Wed 18 May Letterkenny, Thur 19 May Roscommon, Fri 20 May Carndonagh, Sat 21 May Kilcar. There’s a second chance to see drama I Would Walk These Fields Again as it embarks on a mini tour this May as part of the Bealtaine Festival. Produced by An Grianán Theatre in association with the Donegal County Council, I Would These Fields Again is a celebration of the life of well known Donegal native Father James McDyer – his life, his work and his legacy. John D Ruddy and Louise Conaghan in I Would Walk These Fields Again, a play by Guy Le Jeune about Father McDyer of Glencolmcille. Starring John D Ruddy and Louise Conaghan, the play was well received by local audiences when it debuted last year. There will be four performances – starting at An Grianán Theatre on Wednesday 18 May, Roscommon Arts Centre on Thursday 19, Colgan Hall in Carndonagh on Friday 20 and Kilcar Parish Hall on Saturday 21 May. Father McDyer was a man of great energy, humour and conviction, qualities which are captured in this drama by Guy Le Jeune. Born in Glenties in 1910, Father McDyer was ordained in Maynooth. He spent ten years in London during the Second World War where he tended to the needs of the emigrant Irish population. He returned to Ireland, spending four years on Tory Island before being sent to the parish of Glencolmcille in South-West Donegal, in 1951. From then until his death in 1987 he worked tirelessly against what he termed “the curse of emigration”. He encouraged new enterprises, set up a cooperative, persuaded government ministers and their departments to support his ideas and inspired the community to help themselves, rather than rely on handouts from the State. In his own words, he described himself as a “Christian Communist”, taking his inspiration from the political turmoil and radical ideas of the early twentieth century. Writer Guy Le Jeune is Theatre-Artist-in-Residence at An Grianán Theatre, supported by the Donegal County Council and the Arts Council. His previous plays for An Grianán include On The Camel’s Hump and Fiesta. He is currently writing a new musical, Unified, which will be the feature event of this summer’s Earagail Arts Festival. Friday 20 May at 8pm Tickets available on the door. Satharn 21ú Bealtaine/Saturday 21 May at 8.30pm Tickets available on the door. We are reviving our very successful production of Fiesta this autumn and will be holding auditions to recast three of the main roles as well as some chorus positions. The performance dates are Wednesday 4 to Saturday 7 November 2015. A sell out hit at the 2014 Earagail Arts Festival, Fiesta is a celebration of the dancers, the chancers and the lovers who graced the Fiesta Ballroom, Letterkenny – the famous dancehall venue that formed a hugely important part of the social history of Donegal and the wider North West region. Fiesta was originally commissioned for the Earagail Arts Festival as a co-production with Earagail Arts Festival, An Grianán Theatre and Donegal County Council Arts Office and supported by the Arts Council of Ireland, Failte Ireland and Donegal County Council. IMPORTANT: eMail with name and contact number if you are interested in auditioning. Theatre makers! Dreamers of Dreams! Don’t miss Beyond the Pale. Calling all makers and practitioners of theatre. The Earagail Arts Festival have invited a host of international and local makers of community theatre to Letterkenny for a weekend of workshops, talks and performances. It’s a fantastic opportunity to meet like minded people and to explore fresh ways of working, make new connections and creative partnership. 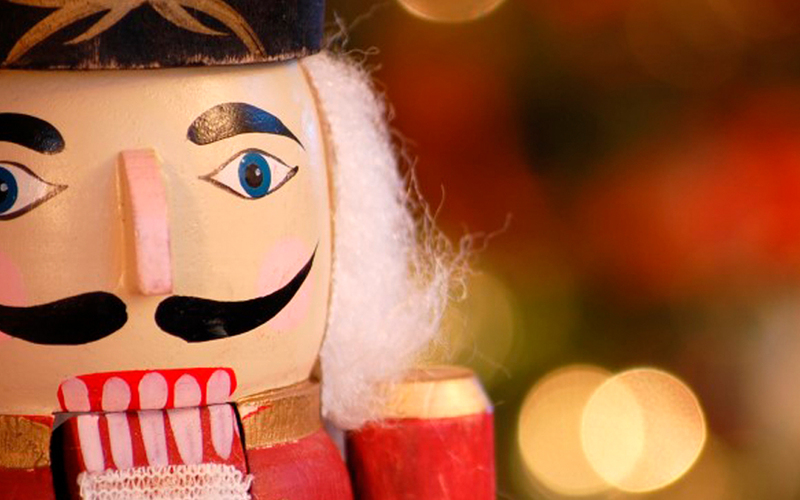 You never know – this time next year it might be you performing at the festival! While the majority of the events will be next door in the Regional Cultural Centre, we will be hosting performances by some of the speakers and participants. Little John Nee & The Highly Strung Orchestra at An Grianan Theatre Letterkenny July 2015 Earagail Arts Festival. Music. Comedy. Storytelling. Little John Nee and his Highly Strung Orchestra will present an evening of music, story and comedy inspired by their crowd funded album Songs from the Lough Swilly Delta on Sat 18 July. Little John Nee will also be one of the speakers at Meet the Makers – Local Theatre for Local People: The Donegal Experience on Sun 19 July at 2.30pm in the RCC, a talk which will also feature An Grianán Theatre, Guy Le Jeune who is the author of community theatre productions Fiesta and On the Camel’s Hump, LUXe are a local theatre company which specialises in big outdoor visually spectacular theatre. The line up is completed by newcomers Bread and Roses who are presented their first production, Dario Fo’s Can’t Pay, Won’t Pay, as part of this year’s festival. Actor Declan Gorman will be doing a couple workshops over the weekend in the RCC before presenting his acclaimed one man show The Dubliners’ Dilemma with us on Sun 19 July. The play recounts the behind the scenes drama of attempting to publish James Joyce’s remarkable first book The Dubliners. Dario Fo’s political comedy farce Can’t Pay Won’t Pay. Bread and Roses Theatre Company, An Grianan Theatre, Earagail Arts Festival, July 2015. Theatre. Comedy. Letterkenny. And if you fancy a laugh then come see Can’t Pay, Won’t Pay. Bread and Roses might be new but the talent behind this new venture are all hugely experienced local theatre practioners. Find out more about the production here. Beyond The Pale – Meet the Makers Symposium, 17 to 19 July, Letterkenny ~View the event flyer here. We’ve had such a great response to our production of Fiesta that we’ve added an extra performance!. We will now run from Sat 12 right through to Tues 15 July. You can book tickets now on 0749120777 or online here. Fiesta is a celebration of the dancers, the chancers and the lovers who graced the Fiesta Ballroom, Letterkenny – the famous dancehall venue that formed a hugely important part of the social history of Donegal and the wider North West region. Find out more. “There are a hundred thousand stories about the Fiesta, some of them may have happened, some of them may have been altered by time and experience. Our memories are strange things. I like to think of them as a favourite book. Every time we open the pages, we scribble notes in the margins or cross out some of the printed words. We might remember strange things such as the scent of perfume or the colour of a wall, but we put other memories away and they are only triggered when we hear a piece of music or see an old photograph. The tea ladies of Letterkenny’s Fiesta Ballroom. Relive the memories at An Grianán Theatre this July! “The stories I’ve heard about the Fiesta would fill an entire book, though some of them might not be printable. Some of the people I spoke to remembered the sense of magic, the faces and the music. Others remember not getting turned because of the crowds and the cigarette smoke that filled the room, stinging eyes. “I’ve heard stories of dress hems going up and down, depending on the fashions; orders from Leo that there were to be ‘No hotpants’; the bouncers and their own code of honour; the sandwich makers and the mineral bar ladies; the terror of a lost cloakroom ticket; wives meeting husbands with two left feet; husbands meeting wives, dancing to a certain tune; the lines of couples courting out the back while the bus drivers, parked up, smoked cigarettes and watched the side-show; sailors from Scotland, Holland and Cape Verde, dancing the nights away; the musicians’ stories of playing there, either in the relief bands or as the main act, the girls all lined up at the front, staring at them; the Austins towing cut-off Morris Minors, converted into trailers; the glowing false teeth under ultra-violet lights; the bingo nights and the concerts. The opening night of the Fiesta Ballroom, Oct 1962. Photo from the Derry People Donegal News. “I’ve also heard stories beyond the Fiesta, of Letterkenny and how it developed; the factories and industry of Knitcraft, Gaeltex, Oatfields, Cortaulds, the Model bakery, the old port at Ballyraine. I’ve heard stories of emigration and return, the Glasgow connections, the boats that took people away and brought them home again for the summer. Guy Le Jeune is the author of Fiesta, a new drama commission co-produced by Earagail Arts Festival, An Grianán Theatre and Donegal County Council Arts Office and supported by the Arts Council of Ireland, Failte Ireland and Donegal County Council. His previous work for An Grianán includes the reminiscence theatre project A Sense of Memory and the play On the Camel’s Hump. His short story ‘Jamesy’ was commended in the 2011 Sean O’Faolain Prize, he was shortlisted for the Fish Short Story Prize 2012 and his story ‘Small Town Removal’ was placed third in the inaugural Costa Book Awards, short story prize in January 2013. His novel extract ‘Essex Road’ was Highly Commended in the 2014 Irish Writers’ Centre, Novel Fair Competition. Fiesta, Sat 12 to Mon 14 July 2014 at 8pm. More info here. We have finalised our main cast for Fiesta, our Earagail Arts Festival show! In the lead roles are Sorcha Shanahan, Orla McGranaghan, Joseph Gallagher and Jason Daly. Playing other roles in the ensemble are Eoghan Mac Giolla Bhrighde, Fionn Robinson, John Ruddy, Valerie Bryce, Sinead Gallagher and Margaret Hannon. In addition we will have a supporting cast of 16 people who have been attending weekly workshops with director Sean Donegan and choreographer Aoife Toner since April. Fiesta is a celebration of the dancers, the chancers and the lovers who graced the Fiesta Ballroom, Letterkenny – the famous dancehall venue that formed a hugely important part of the social history of Donegal and the wider North West region. While the ballroom has been closed for many years, the building itself still exists and trades as Cable and Accessories on the Port Rd. Performance Dates: Sat 12 to Mon 14 July at 8pm. Tickets €15/€12. Book now!